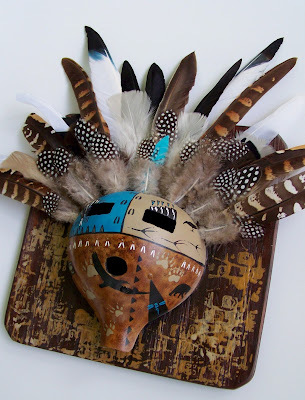 For the deep love I have for animal totems and their special meanings in our lives, I felt compelled to create a gourd mask that represented a few of my most admired ones. The creation is symbolic for the gathering of their energies and wisdom that they offer, including Heron, Crow, Deer, Hawk, Bear, Otter, Owl, Wolf, Lizard, and Dragonfly. Animal Totem Gourd Mask "Unveiling of the Animal Totem Gathering"
"Unveiling of the Animal Totem Gathering" is an animal totem mask for wall display. The mask is created from a gourd which is shaped and cut and mounted on a wood plaque that measures 10 inches x 10 inches. 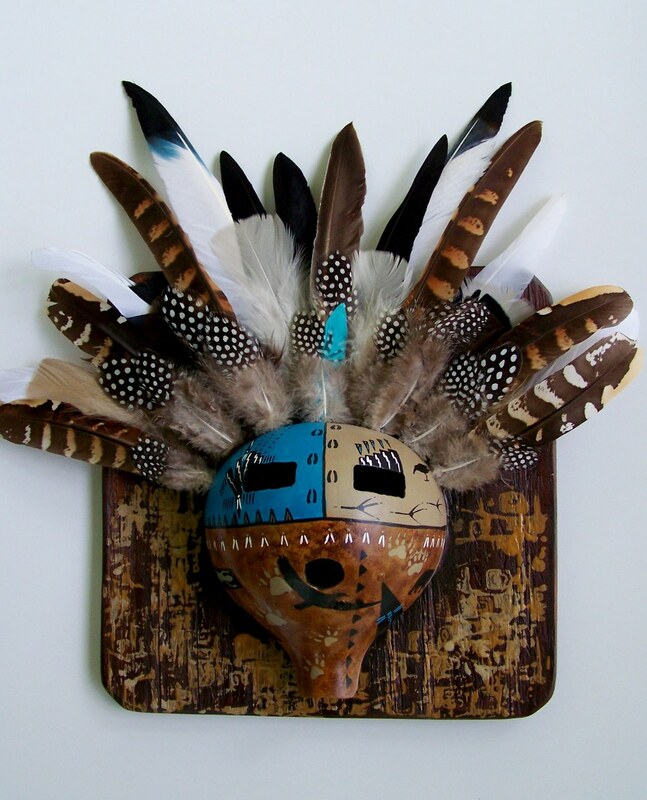 The mask is painted with acrylics in burnt umber, turquoise, and tan colored and then detailed with animal totem silhouettes and tracks of the Crow, Heron tracks, Bear, Otter prints, Hawk, Dragonfly, Wolf prints, Lizard, and Owl. The mask was then sealed with a satin finish. A multitude of man created feathers were used to create the crown of the mask representing a number of bird totems. The plaque was painted in burnt umber with tan colored designs and has a hanger installed on the back for display purposes. The piece in it's entirety measures 14 inches x 14 inches. This piece is to be shipped double boxed to protect the feather work and will be insured. The Bald Eagle is rich in symbolism and greatly revered for it's majestic persona. In particular, the bald eagle is representative of the Feminine, of great healing, oneness with the universe, and a wisdom from those that walked before us. It's beautiful mantel of white feathers on it's head symbolize a great connection spiritually and the ability to look at the "bigger picture". They soar high and hunt low, bridging the gap between the sky and earth. Their 4 toes, for the four directions, represent a completeness, a wholeness of the spirit. As a predator, they are highly adept in their hunting. Perching until they go in for the swoop...reminding us to hone our skills and be confident when seeking what we desire. They use their balanced character and all senses while hunting, being "one" with the universe while gliding through the circle of life. Sometimes life throws you a curve ball and you are forced to change.The transformation can manifest in many ways. As an artist, I find our creativity evolves with these life occurrences and our personal growth. 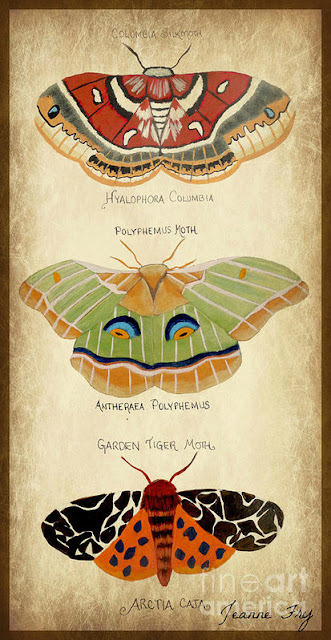 Recently I found this evolution in my own artwork yet again. My art usually represents my philosophies and experience, and as I grow and evolve personally and meander through my own journey in life, as does so on the canvas. A few days ago a canvas sat before me and my physical body was greatly fatigued.I studied on that canvas...almost a meditation. Inside my spirit had so much it wanted to release even though this body did not necessarily want to follow suit. Knowing that my usual style of painting would be too intricate and controlled, that day I needed to bring my feelings to the canvas with a graceful ease, a flow from the heart to the hand. This was the creation. The inspiration behind this painting is symbolic of a "feeling"....a feeling that comes from that place deep inside your belly where your desire..your passion for life..and your creativity reside. No matter how many things are piled on your shoulders, no matter the challenges that you face, nor how weathered you may feel....deep inside this place you are vibrant, alive, and your passion burns on. I am not sure how long this style of work will stay with me, but I am grateful for the inspiration and ability as always, and will release and create as long as the fire burns in my belly. This painting is not available any longer. 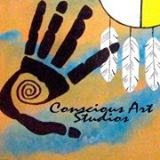 You can visit our Artfire studio to see available paintings. Dragonflies are one of the most beautiful and delicate animal totems to work with. They will usually show up when one needs to be reminded of keeping a balance in their emotions. It reminds us to look at different perspectives and to live in the present. The dragonfly's beauty of light and color encourage us to let our own light shine, and in turn encourages others to do the same. They can inspire us with their balance of skill, agility, and strength while all the while doing so with grace and ease.